You might think of a form of martial arts upon hearing the Chinese words Kung Fu. Yet in this case, the words hold an entirely different meaning. Kung fu, also spelled as Gong Fu, means "effort." And when these words are adhered to tea, it conveys brewing tea with effort. During the many times that I visit a Chinese restaurant, the tea is usually served in a pot where the tea leaves are left to steep. I love drinking that type of tea, as the hot temperature of the beverage perfectly complements the usually very greasy nature of Chinese dishes. However, appreciating fine tea takes more than just leaving hot water in a pot with a quarter full of leaves. Several steps must be taken before the tea is finally poured onto the drinking cups. Here in this article, I will be introducing you to the art of brewing tea Kung Fu style. In the photo: tea cups, tea pot, and serving pitcher with strainer. It takes more than a mug and a teapot to brew a Kung Fu tea. In the traditional way of brewing tea, a much smaller pot - around 5 ounce in capacity - is used to steep the leaves. The cost-effective small pot allows shorter steeping time and more number of steeps of the tea leaves. The drinking cups are also very small - enough to be emptied in one gulp (however, you should sip the tea instead of gulping) - to let drinkers focus more on tea appreciation rather than quenching the thirst. Instead of brewing tea in a teapot, a gaiwan may be used instead. 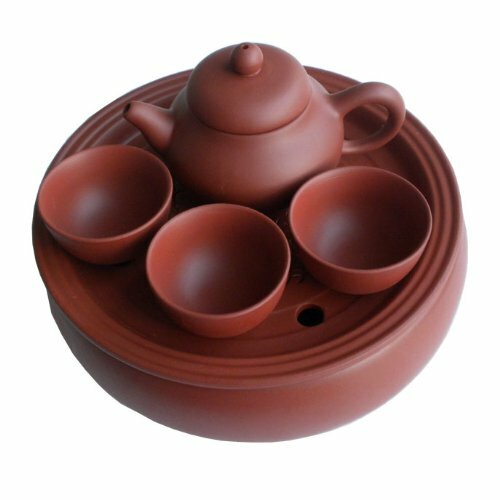 Gaiwan looks like a much larger cup with a lid and small saucer plate. Instead of the tea pot where tea comes out through the snouts, the tea from the gaiwan is carefully poured out while slightly slanting the lid to filter the leaves. If you are serving a large group of tea drinkers, then brewing in a 5-ounce teapot once is not enough to fill in several cups. The freshly steeped tea is poured first into the much larger pitcher through a strainer for a number of times. When the vessel becomes full, then it will be poured onto the cups for all the guests. That way, everyone will be able to sip the tea at the same time, and each can enjoy the same taste and strength of tea as the different steeps is already homogenized in a single pitcher. Tongs is a tea accessory during the rinsing process of the tea cups. It may be used to dip the cup in another cupful of hot tea which is used to rinse it. Part of the Kung Fu brewing is rinsing and warming the pots and cups. The spills from the process is collected in the grilled tray where a pan is located beneath it. Other tea tray designs I've seen have drainage holes instead of grilles to collect the spills. Here, a gaiwan is used instead of a teapot to brew tea. You can also see several clay ornaments decorating the tea tray. 1. Put the required amount of tea leaves inside the tea pot or gaiwan. 2. Warm and rinse the teapots and tea cups by pouring hot water inside and outside the pot (or gaiwan). Quickly transfer the water from the pot onto the cups as if you're serving. You can use tongs while handling the hot tea cups as you wet the outer surface of the cups with tea water by dipping one cup to another full cup. 3. Discard all the water. 4. Again, pour hot water inside the tea pot using the same tea leaves. Leave it for thirty seconds before pouring it into the serving pitcher with strainer. This time the tea water is not discarded. 5. Steep for additional round, then pour again into the pitcher, until it becomes full. Each additional steep shall take 10 seconds longer for each successive time. 6. Pour the contents of the pitcher into the small tea cups. 7. Serve, sip, sniff, and enjoy! Water temperature depends on the type of tea you are using. To learn more about it, check the packaging of your tea. Also check labels for the amount of tea leaves required for steeping. While the amount varies from tea to tea, you may start with 1-2 teaspoons per 6 ounce, then adjust accordingly according to your desired strength. Milder tasting teas can be steeped at least four times. Stronger teas such as oolong and black tea can be steeped more times. Steeping for a longer time will make the tea taste bitter. 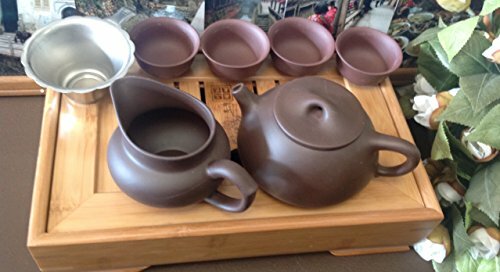 For Yixing Clay tea ware, never use soap and detergent to clean them. The smell will linger and destroy your tea's flavor. Use separate tea pots for each type of tea.